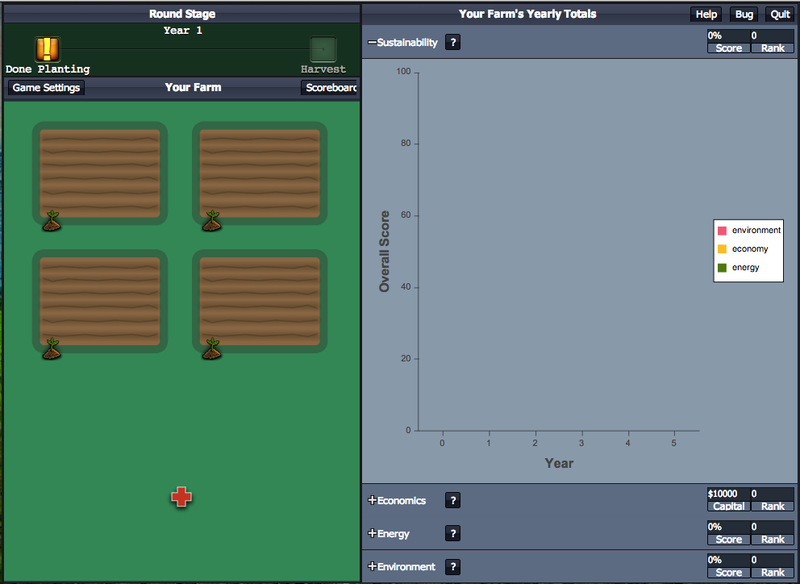 Overview: In single-player mode, the user plays along or against the computer, competing against "robot" farmers to get the highest sustainability score. You can pursue other goals, such as earning the most money but the computer players are programmed only to attempt to get the highest sustainability score. It is up to you to decide for how many rounds ("years") you want to play. 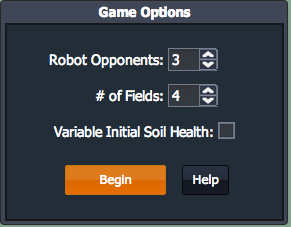 Single player mode can be a fun, useful option for trying out game features, getting accustomed to the flow of game play and experimenting with different farm management strategies. 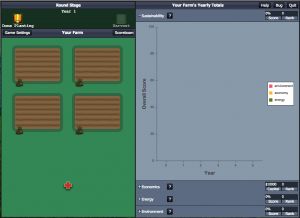 If you play by yourself (no computer players) the game serves as a simulation tool for exploring the effects of different planting and management decisions. The above video demonstrates how to set up a single-player game. Written step-by-step instructions are also available below. 1. On game landing page click “Play”. 2. 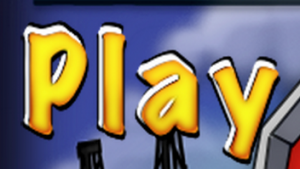 In next pop-up window, select “Single Player” option. 4. Select your game options. Note these cannot be changed once the game starts. Visit the game options page for more information. 3. Choose your game settings in the next "Moderator Controls" window. These settings can be changed during the game by navigating back to this window. If you ever close the window, it can be reopened by clicking the “Game Settings” button on the player screen. Visit the Moderator Controls page for more details on the how to adjust various settings. 4. When you are happy with the game settings, click "Start" at the top of the window to open your player screen. This will open a new tab or window with your player interface. Visit the Gameplay section for instruction on how to proceed through the stages of the game and interpret your scores and graphs. 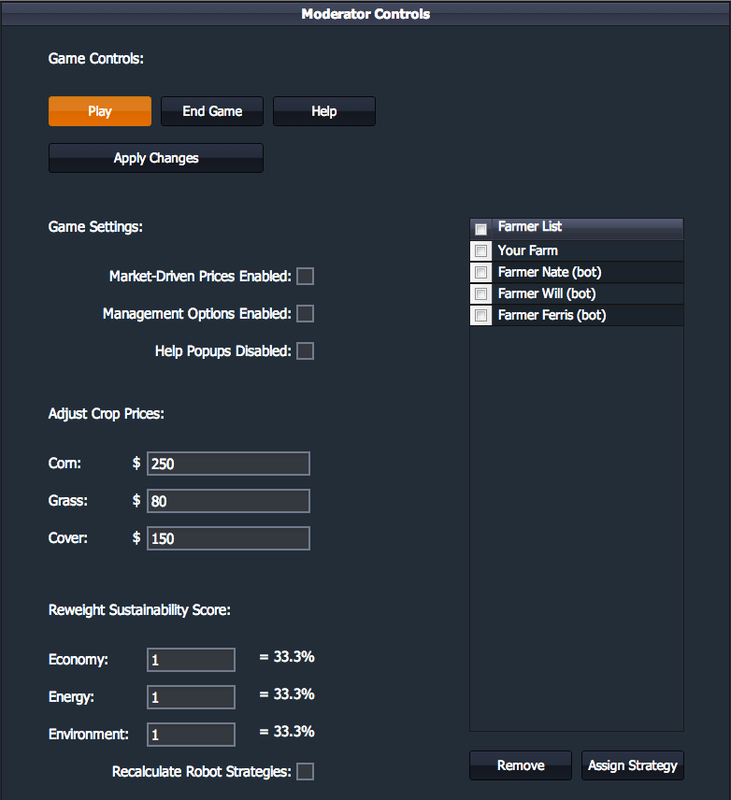 Remember, you can adjust game settings, crop prices and how your sustainability score is weighted in the moderator window at any time.